This morning I was reading my blog comments, and there it was–a lovely surprise. 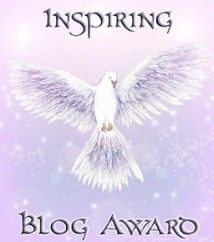 Thank you, mypenandme at http://mypenandme.wordpress.com/2012/06/07/inspiring-blog-award/ for nominating Images of China through English Eyes for this award. 7. I travel whenever possible but still have many places left on my bucket list including Papua New Guinea, New Zealand, Canada, Fijian Islands and Bhutan. Fantastic. You deserve it. I love your pictures. Congratulations on receiving the award, and thank you for nominating me. Mark, congrats on your award and many thanks for the nomination. I hope to run into you when you finally make it to Canada. Thanks you :)…I hope so too..
Congrats! You do have a lovely blog.